Here are two compelling series with LGBTQ characters that will appeal to fans of Tanya Huff’s Smoke Trilogy, Jim Butcher’s The Dresden Files, Laurell K. Hamilton’s Anita Blake: Vampire Hunter, or Seanan McGuire’s October Daye series. Since they are both available as ebooks they are just a click away for our Hoboken Library Resident Cardholders. So check them out now for an enjoyable Labor Day Weekend read or put them on your wish list for October when Halloween and Coming Out Day (October 11) make it the perfect time to read about some out and proud Vampires, Werewolves, and Witches. The Sleepless City is a gay paranormal romance series, written by Anne Barwell and Elizabeth Noble, available to our resident Hoboken Library cardholders through eLibraryNJ. The series revolves around several roommates and friends, some of whom are vampires. In the mythology of The Sleepless City vampires have one true soulmate, but just because someone is your soulmate doesn’t mean there is an instant happily ever after and as each of the vampire main characters of the book finds their romantic partner they must navigate relationship issues as well as some suspenseful supernatural dilemmas. Much like the Hellmouth in Buffy the Vampire series, there is a lot of mystical trouble in the small town of Flint, Ohio. Besides vampires Jonas, Declan, and Simon, aficionados of werewolves will enjoy the character of Lucas Coate. I’m usually more a vampire fan myself, but I found Lucas to be one of my favorite characters from the series. Rather than co-write each book, the authors alternated books in the series. 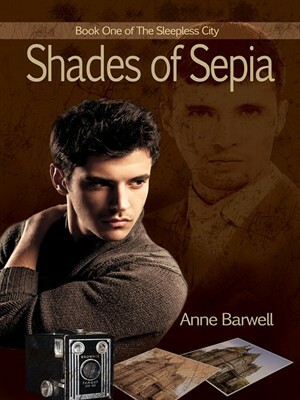 Barwell wrote the first book Shades of Sepia and the third book Family and Reflection. Noble wrote the second book Electric Candle and the soon to be released fourth and final book tentatively titled Checkmate. I was unsure if the series might feel disjointed by having two authors, but I found it had the beneficial effect that their slightly different styles helped delineate the different characters they were focusing on. If you become a fan of the series you might find yourself wanting to binge read to find out what happens next to the well written and interesting characters. Although The Sleepless City series ends after book four, the authors will each be working on two separate spinoff series. The Sleepless City is published by Dreamspinner Press, who specializes in Gay romance titles, some of which are also available to our Hoboken Library Resident Cardholders through eLibraryNJ. There are two books so far in Alexis Hall’s Kate Kane lesbian urban fantasy mystery series including Iron & Velvet and Shadows & Dreams. A third book Fire & Water is planned. 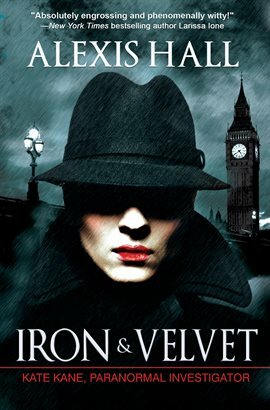 I found myself so immersed in the world of the first book Iron & Velvet that I finished it in two days. Kate Kane is a terrific character, a half fairy private eye with a biting wit who tries to fight against letting her powers derived from her mother, The Queen of the Wild Hunt, take over her life. There are so many other wonderful characters in the world including Julian Saint-Germain, an eight hundred year old lesbian vampire prince; Tara Vane-Tempest, the upper class model who is also an alpha werewolf; Nimue, Kate’s ex and a Witch Queen; her assistant Elise, a golem-like “living statue;” and informant Jack who is a part of “the Multitude,” a gestalt mind made up of rats! Although cleverly original, the book also satirizes some tropes of both the noir mystery and the urban fantasy genre. Kate has a vampire ex who she met in high school biology class who creepily liked to watch her sleep, is overprotective, and bears other traits that seem reminiscent of a certain sparkly vampire. LGBTQ publishers Riptide Publishing also have several other series by Alexis Hall including Prosperity, a steampunk series, which is available through Hoopla. Some of Riptide’s other books are also available there and on eLibraryNJ. ← Top 5 Books! Because It’s….August!